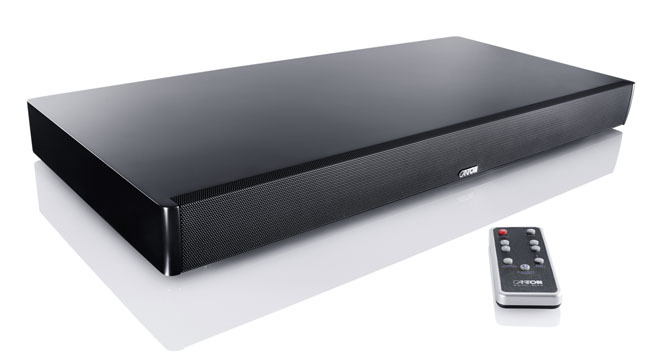 Arcam’s sound bar debut is thumpingly huge, good deal fatter than most and tipping the scales at 6.4kg, it's not something you’ll easily hide. Of course, there’s good reason for such girth. It moves air like a regular pair of bookshelf monitors and sounds astonishingly similar to two separate speakers, with wide dispersion, excellent mid-range articulation and precise imaging. The overall finish is also reassuringly premium. The Solo Bar employs a low resonance aluminium enclosure, containing bass, mid-range and high-frequency drivers. The bass and mid-range each receive 20W from the onboard amp, with the tweeters getting 10W. To help create as wide a soundstage as possible, these high-frequency cones are angled out by 5 degrees. The rear reveals a fully integrated HDMI switcher, with four inputs all boasting 4K passthrough. Functions can be handled from the supplied remote or the Solo Bar app for iOS and Android. The Solo Bar downmixes Dolby TrueHD and DTS HD MA sources. There are also two digital audio inputs (coaxial and optical), plus a 3.5mm minijack. In addition to aptX Bluetooth reception, the soundbar can transmit to any Bluetooth equipped headphones, convenient for late night listening. The Solo Bar is at its best in pure stereo mode, but there are two DSP processing modes, Movie and Concert, which basically add levels of reverb which is somewhat superfluous. It ships with an auto calibration microphone to optimize setup. The Arcam Solo looks set to be a soundbar that even hi-fi purists would covet, but if you get a demo just be sure that you also get to hear it without Solo sub, as it's another £500. Naturally, the Arcam Solo sub warms things up considerably and if you were sold the Arcam Solo on the strength of hearing this combination, you'd certainly notice the difference if you went home without it. The DM75 is a sound plinth design with enviable European hi-fi DNA. The larger of two models from the German audio marque, it sports some 200W of unexaggerated amplification. Not only can the DM75 be driven at volume without distorting, it also retains intelligibility at lower levels. Build quality is excellent. The DM75 is specified to hold screens up to 40kg, and looks swish in a minimal way. You can even décor match with black, silver or white finishes. Four 10cm woofers blend smoothly with two 5cm drivers and a pair of 2.5cm tweeters positioned behind the metal fascia. Inputs comprise analogue stereo plus coaxial and optical digital. The DM75 also supports aptX Bluetooth streaming. There’s not overmuch when it comes to post processing, just effective stereo and "surround" options, including DTS TruSurround. Dolby Digital is downmixed. Overall, this is a high performance upgrade from a hi-fi heavyweight.